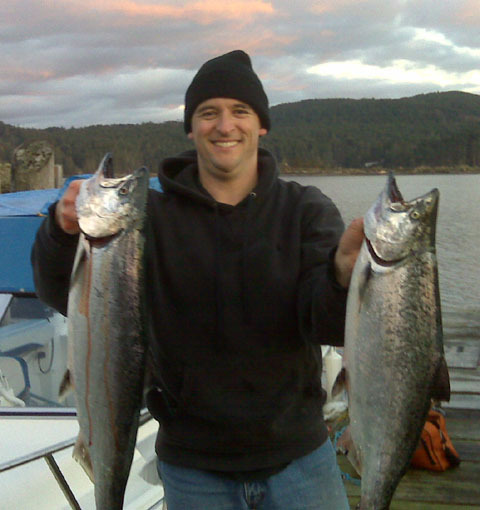 Some fun winter spring salmon fishing to be had in Sooke these days. The action is best towards Possession Point and out past the southern side of Secretary Island....though it will change day to day, depending on where the bait is. As usual for this time of year, the chinook salmon are generally right off the bottom, 130-160'. Most anglers are using hootchies with glow in them, along with glow flashers, but bait and spoons are said to be working well too. "I had a good little solo session...two chubby 8 pounders right off the bat, done in an hour. Both at 150' in 160' of water between Possession and Secretary. First one red glow flasher, white glow hootchie. Second one a little blue/glow spoon, no flasher, on fly rod...fun! Bellies of both full of little anchovies...about 15 in one of them. Beauty afternoon...nice and warm, sweatshirt only, no jacket needed, regretted not having sunglasses...nice problem to have this time of year." The salmon are smaller, mostly under 10 pounds, though you hear about a bigger one once in a while. However, you won't taste a better table fish than a fresh caught winter spring salmon. If you have the time, it is definitely worthwhile to get out there and get a line wet.